The Medford Township Police in cooperation with the Drug Enforcement Agency will give the public its tenth opportunity in four years to prevent pill abuse and theft by ridding their homes of expired, unused, and unwanted prescription drugs. 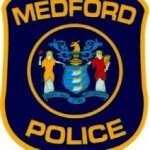 The event will take place at the Medford Township Public Safety Building, located at 91 Union Street in Medford, between the hours of 10 a.m. and 2 p.m. on Saturday, September 26, 2015. Only pills or patches will be accepted, no liquids, needles, or sharps. The service is free and anonymous, no questions asked. Medford Police Chief Richard Meder stated, “As a police department, one of our primary goals is to help keep our community members safe. In keeping with this goal, we have partnered with the Drug Enforcement Administration to provide a safe and anonymous way for residents to discard potentially harmful prescription drugs.” In the previous nine Take-Back events nationwide from 2010–2014, 4,823,251 pounds, or 2,411 tons of drugs were collected. This initiative addresses a vital public safety and public health issue. Medicines that languish in home cabinets are highly susceptible to diversion, misuse, and abuse. Rates of prescription drug abuse in the United States are alarmingly high- more Americans currently abuse prescription drugs than the number of those using cocaine, hallucinogens, and heroin combined, according to the 2009 National Survey on Drug Use and Health. Studies show that individuals that abuse prescription drugs often obtained them from family and friends, including the home medicine cabinet. In addition, many Americans do not know how to properly dispose of their unused medicine, often flushing them down the toilet or throwing them away- both potential safety and health hazards. For additional information, and other collection sites, can be found by visiting www.dea.gov, and clicking on the “Got Drugs?” banner.